We’ve released a new data panel for those that have Premium accounts on Empire which breaks down your last Dividend Payout if you are playing the Social Stocks game. Every day you pay out an amount of Eaves per share to every Shareholder you have. That payout, which we call your "Dividend Payout", is based on your social media activity and engagement over the previous day or so. All your networks can contribute to your Dividend Payout, but it depends mostly on your top five networks that day. To prevent dividends from fluctuating too much, in some cases your payment may be higher that these raw top 5 scores would indicate. Before today, we never revealed which networks contributed to your Dividend Payout and how. You can find this data panel on the main Social Stocks Dashboard. 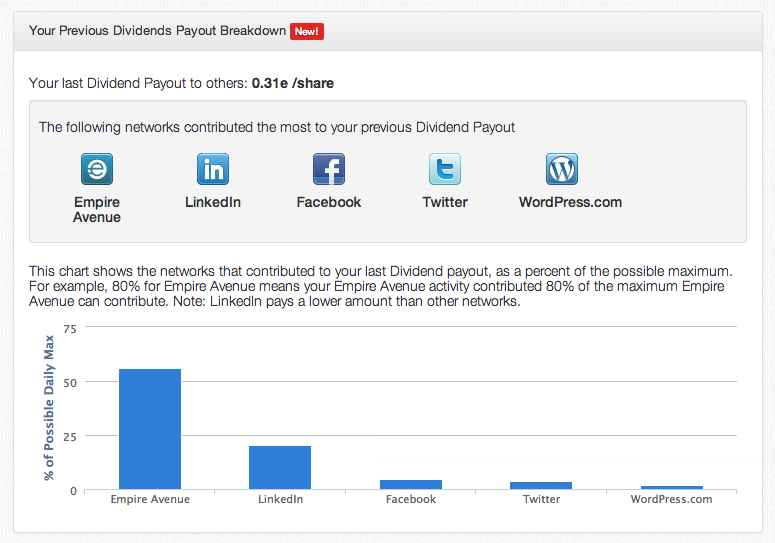 All Premium accounts will now be able to see the Top 5 networks contributing to your last Dividend Payout. The importance of each network in your Dividend payout decreases from left to right. For example if your Top networks in order from left to right are Empire Avenue, LinkedIn and Twitter, then that is also the order of importance in your last Dividend Payout. You can now see a breakdown of those Top 5 networks in a chart. This chart shows the networks that contributed to your last Dividend payout, as a percent of the possible maximum. For example, 80% for Empire Avenue means your Empire Avenue activity contributed 80% of the maximum Empire Avenue can contribute. A couple words of note: (1) The data is cached for a couple of hours and therefore you will likely have to wait a couple of hours after our Market Makers run to see the previous day’s data. (2) LinkedIn pays a lower amount than other networks. Having the data is great, but what can you do with it? For anyone interested in improving their Social Media presence, you can use the Dividends number to measure and improve your engagement. You can now see what network to effort into, whether it’s a bit more increased activity or a bit more engagement in creating content that garners more likes, comments, retweets. If your score on a network is 100%, you know that further effort on that network will not further increase your total Dividend payout and you should focus efforts elsewhere. For a business starting out in Social Media, this can be an invaluable tool. Please note, we do no require unrealistically high activity levels to achieve high dividend levels For example, it is possible to achieve a 100% contribution from Twitter if you do just 10 tweets a day, if each tweet gets massive engagement. By contrast, thousands of tweets a day in the absence of engagement will not result in anywhere near a 100% score. Please read about how Dividend Payouts are calculated in our FAQ. To get this data, upgrade to a Premium Account today in our Shop!